I was away for the day at a training course, and it was Papa's day off. I wasn't likely to be back in time to cook supper, so Papa decided he would cook, as long as I gave him nice clear instructions. So over breakfast, I typed a recipe (my style of recipe, of course!) and emailed it to him. He followed it, and the result was a spectacularly tasty meal. 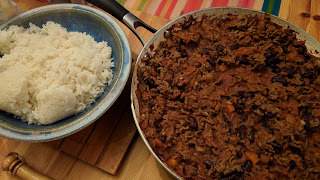 Maybe I enjoyed it more because I didn't cook it, but I suspect equally because Papa has a very good palate, this was the best non-chilli I've had. 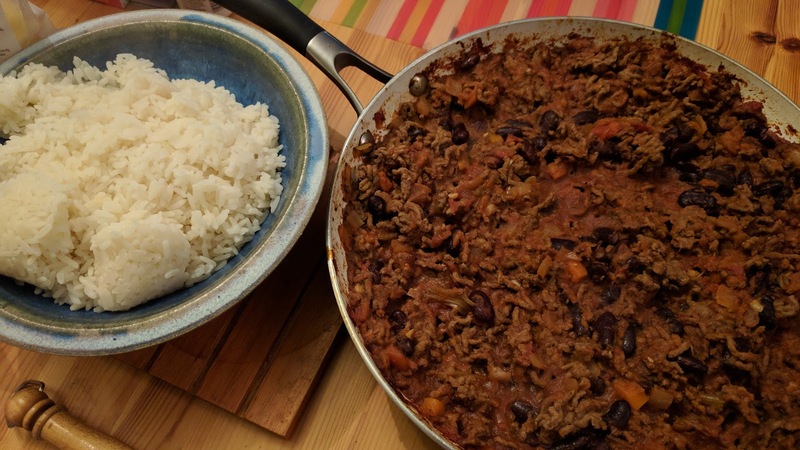 Notes: we call it non or not chilli because it isn't spicy at all, and those that wish it spicier add hot sauce at the table. Tiny and Littl'Un are terrified of spicy heat (to the point that Tiny recently had plain rice in school because he was frightened of the "chilli" that was being served with it...) so I call it this to reassure them. Here is the recipe as he used it, edited to make it more general. Heat up a large frying pan with a tablespoon of olive oil. Swirl it about to spread. Keep flame medium size. If this seems tricky, brown the meat in the oil first then add the frozen sofrito, onions and garlic to the meat. Once both sides are brown, gently break up the meat and fry until no pink remains. Mix in the previously fried sofrito, onions and garlic. Add the mashed up stewed veg* from the gammon stock and mix well. Add a teaspoon of ground cumin and one of paprika. Add 1 tsp salt. Add a heaped teaspoon of Marigold. Now add a tin or tetra of chopped tomatoes. Stir well. Add a splash of red wine or water if you can’t find open red wine. Add a beef stock pot or cube. Add the drained and rinsed kidney beans. If it's starting to dry, just add a splash more water while it simmers. Serve with soured cream, grated cheese and some seasonal steamed veg on the side also. * I mentioned this stewed veg here recently. Obviously, if you didn't make a stock recently, you won't have this, but if you do make a stock with some veggies which you then normally chuck away, I recommend mashing them up and either using them in a base like this soon, or freezing for a sort of sofrito or concentrate in the future. It really boosts the flavour with something many people chuck out.